The quill of the North American Porcupine, like the on shown above, is a marvel of design. When the porcupine raises his quills, experienced predators retreat. Many an uneducated dog, however, has made the mistake of advancing on the otherwise defenseless porcupine. When this happens, the quills of the porcupine slide easily into the flesh of the dog's nose and month and stick there, and when the dog retreats the quills detach easily from the porcupine and remain in the dog's mouth. Fortunately, however, the quills are covered with an antibiotic so that the dog, who has now learned about porcupines, does not have an infected mouth. The quills are beautifully designed for their intended purpose, but nothing more. 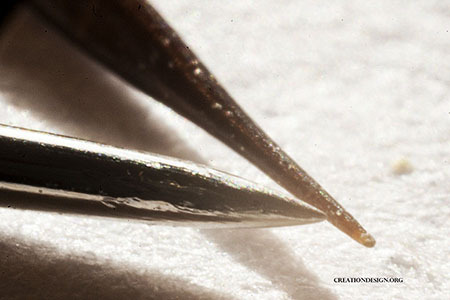 As can be seen from the photograph above, the quill much larger than a small needle, yet much sharper. In order for the porcupine to raise the quills, the porcupine has a muscle attached to each quill follicle (thirty thousand of them). In order to control the muscles and raise and lower the quills, the porcupine has nerves that send electronic messages to the muscles. The muscles contract to the extent that the signals demand. The muscles are programmed to respond to the brain's signals. In order to know when to raise and lower the quills, the porcupine has been endowed with sufficient intellect to be able to identify a threat. The quills are designed to come out when pulled and stay with the attacker, so they are each connected to the porcupine with a small filament that becomes detached easily. The sharp end of the quill is exquisitely designed for its intended purpose, far more so, for instance, than a common needle. 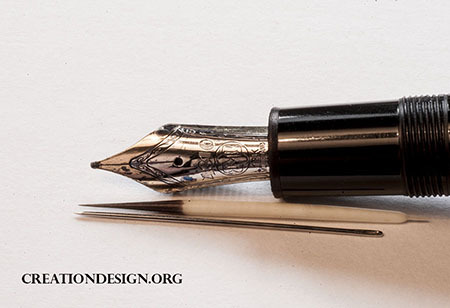 Note that the point of the quill is flexible, sleek and much more slender than the needle, non metallic, yet more efficient. The needle appears blunt in comparison. The tip of the quill is equipped with scales that make it extremely difficult for the quill to be removed from flesh once it has been embedded. A porcupine quill is so difficult to remove, a pair of pliers is normally used when veterinarians remove quills from dogs' mouths. 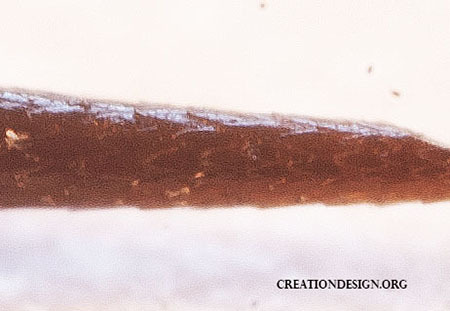 The design of the porcupine quill, both the ease of insertion and the difficulty of removal has now attracted the attention of medical researchers looking for painless needles and a method to hold a wound closed without stitches. See Woo Kyung Cho, James A. Ankrum, Dagang Guo, Shawn A. Chester, Seung Yun Yang, Anurag Kashyap, Georgina A. Campbell, Robert J. Wood, Ram K. Rijal, Rohit Karnik, Robert Langer, and Jeffrey M. Karp. Microstructured barbs on the North American porcupine quill enable easy tissue penetration and difficult removal. PNAS, December 10, 2012 DOI: 10.1073/pnas.1216441109. See also Massachusetts Institute of Technology (2012, December 10). Inspiration from a porcupine's quills. ScienceDaily. Retrieved December 11, 2012, from http://www.sciencedaily.com­/releases/2012/12/121210160848.htm. Researchers in the above referenced article found that the quill is equipped with microscopic barbs that do two things, first, they reduce the amount of pressure necessary to insert the quill by 56% and second, they increase the difficult of removing the quill by four times. 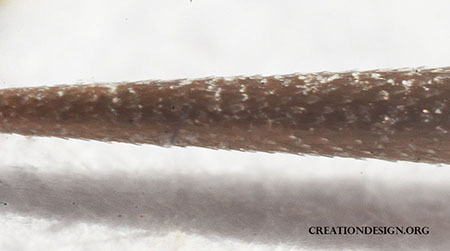 The barbs, which appear to be scales in the photograph below, concentrate force along their edges, similar to how the serrations on a knife blade make cutting easier. The microscopic barbs point backward. They protrude very slightly, just enough to catch the flesh and then spread outward when pulled back. The the barbs have sharp edges that are designed to reduce the pressure necessary to insert the quill, and the very slight raised angle of the barbs that open our when pulled back are all designed for a single purpose by a Designer. It is not convincing to argue that some early form of rodent got better and better by random chance and survival of the fittest until he has instruments that accomplishes things that medical science cannot. Here we see that the barbs, or perhaps more accurately "scales," are equally spaced and overlap each other like slats on a roof. They are not rounded on the edges; the edges are sharp. The tired evolutionary explanation for the porcupine quill is no longer credible: normal hairs mutated into heavy hairs that mutated into quills that mutated into quills that detach easily that mutated into quills with points that mutated into perfectly designed points that mutated into points with equidistant barbs all facing backward that mutated into barbs with sharp edges... Where is the evidence for all of those accidental mutations? How can accidents produce such exquisite design? Consider the same explanation applied to the knee joint. By random chance and dying animals the knee joint is supposed to have mutated more and more until finally its coefficient of friction is roughly equal to that of rubbing two pieces of ice together. A series of fortunate accidental mutations? See Salter, R.B. Continuous Passive Motion (CPM) (1993) (this analogy is common knowledge). Consider a similar accounting for the electrical perception in sharks. Those same undirected random mutations and survival of the fittest supposedly took a primordial fish and strung hundreds of nerves from its brain to its snout, enabled them all to detect electricity, programmed the brain to enable it to assimilate all of the information from the nerve endings and create a perception of the location of its next meal in the dark. But then these supposed random mutations did not stop there. They kept on improving the shark until finally the shark's perception was so efficient that it could detect a current made by an AA battery hundreds of miles away. A series of extremely fortunate mutations? See shark. The tired evolution argument attributes nothing but theoretical accidental mutations to the eyes of bees that contain 4500 perfectly aligned lenses to enable instantaneous broad perception without the distortion of a wide-angle lens so that the bee can fly fast through forests without touching a twig or move in a swarm without collision. And these same fortunate mutations coincidentally created a brain to analyze and implement the millions of instructions streaming from the eyes, a brain the size of a pin-head but at least as powerful as a super-computer, a pin-head sized brain that runs on sugar at 100,000,000,000 (one hundred billion) organized operations per second when merely resting. A string of supremely fortunate mutations? See honeybee. And what about our own eyes, that through these alleged chance mutations can perceive a billion or more separate colors - each one conveyed by a separate and distinct digital code and all arriving at the same time to a brain that instantaneously converts them all into an accurate full color three dimensional moving "picture" of external reality. See vision. Did all those separate codes for each different color - and the computing power to read them - really happen by "fiddling around," trial and error, accidental mutations and dying animals? Do you really believe that? Or do you believe it because you have initially made a theological determination - that there simply is no Creator, no matter what the evidence? These wonders pale beside memory. Yet the same 19th century litany applies. These same random accidental mutations supposedly formed into a neuronet of inconceivable size that stores the memories of a lifetime into the electrical charge of the molecules of brain cells - and indexes them. Come now, how many molecules do we have in our brains? And to encode a lifetime of memories into their electrical charges and then index them? Come now. One cannot believe that this happened through a series random mutations unless one makes the theological conclusion that there simply is no Designer. So, why not forget about religion entirely and ask yourself "What is more reasonable?" Did all of that really happen by means of an unobserved series of random accidents and dying animals or was it designed? See memory. These miracles are indeed the "greatest show on earth." And the theory of evolution that evaluates them is indeed a circus, and it has its hucksters. So look for substantive proof and objective observation. Look carefully and you will find professors whose careers are on the line, atheism, eloquent language, wealth, power, smoke and mirrors.